John Webster (1580?–1634). The Duchess of Malfi. Latest news abroad in Malfi: The Duchess has run off with her butler. But this happened before the days of newspapers or radio, so Webster made from it an exciting play. 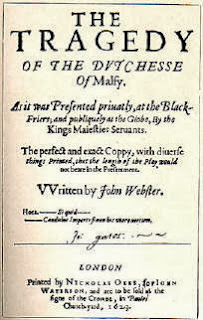 *Correction from the original text which prompted to read pages 721-737 which would have been from the play, Philaster rather than The Duchess of Malfi. Of beasts and fatal fowl! And die in love and rest. FIRST MADMAN. Doom’s-day not come yet! I ’ll draw it nearer by a perspective, 1 or make a glass that shall set all the world on fire upon an instant. I cannot sleep; my pillow is stuffed with a litter of porcupines. SECOND MADMAN. Hell is a mere glass-house, where the devils are continually blowing up women’s souls on hollow irons, and the fire never goes out. FIRST MADMAN. I have skill in heraldry. FIRST MADMAN. You do give for your crest a woodcock’s head with the brains picked out on ’t; you are a very ancient gentleman. FIRST MADMAN. Come on, sir, I will lay the law to you. SECOND MADMAN. O, rather lay a corrosive: the law will eat to the bone. THIRD MADMAN. He that drinks but to satisfy nature is damn’d. FOURTH MADMAN. If I had my glass here, I would show a sight should make all the women here call me mad doctor. FIRST MADMAN. What ’s he? a rope-maker? THIRD MADMAN. Woe to the caroche 4 that brought home my wife from the masque at three o’clock in the morning! It had a large feather-bed in it. FOURTH MADMAN. I have pared the devil’s nails forty times, roasted them in raven’s eggs, and cured agues with them. THIRD MADMAN. Get me three hundred milch-bats, to make possets 5 to procure sleep. FOURTH MADMAN. All the college may throw their caps at me: I have made a soap-boiler costive; it was my masterpiece. Here the dance, consisting of Eight Madmen, with music answerable thereunto; after which, BOSOLA, like an old man, enters. DUCH. Is he mad too? BOS. I am come to make thy tomb. Gasping for breath. Dost thou perceive me sick? BOS. Yes, and the more dangerously, since thy sickness is insensible. DUCH. Thou art not mad, sure: dost know me? BOS. Thou art a box of worm-seed, at best but a salvatory 6 of green mummy. 7What ’s this flesh? a little crudded 8 milk, fantastical puff-paste. Our bodies are weaker than those paper-prisons boys use to keep flies in; more contemptible, since ours is to preserve earth-worms. Didst thou ever see a lark in a cage? Such is the soul in the body: this world is like her little turf of grass, and the heaven o’er our heads like her looking-glass, only gives us a miserable knowledge of the small compass of our prison. DUCH. Am not I thy duchess? BOS. Thou art some great woman, sure, for riot begins to sit on thy forehead (clad in gray hairs) twenty years sooner than on a merry milk-maid’s. Thou sleepest worse than if a mouse should be forced to take up her lodging in a cat’s ear: a little infant that breeds its teeth, should it lie with thee, would cry out, as if thou wert the more unquiet bedfellow. DUCH. I am Duchess of Malfi still. But, look’d to near, have neither heat nor light. DUCH. Thou art very plain. BOS. My trade is to flatter the dead, not the living; I am a tomb-maker. DUCH. And thou comest to make my tomb? DUCH. Let me be a little merry:—of what stuff wilt thou make it? BOS. Nay, resolve me first, of what fashion? DUCH. Why, do we grow fantastical on our deathbed? Do we affect fashion in the grave? BOS. Most ambitiously. Princes’ images on their tombs do not lie, as they were wont, seeming to pray up to heaven; but with their hands under their cheeks, as if they died of the tooth-ache. They are not carved with their eyes fix’d upon the stars, but as their minds were wholly bent upon the world, the selfsame way they seem to turn their faces. This talk fit for a charnel. I wish it in their veins to do them good. BOS. This is your last presence-chamber. CARI. O my sweet lady! DUCH. Peace; it affrights not me. The night before they suffer. By degrees to mortification. Listen. Here your perfect peace is sign’d. Of what is ’t fools make such vain keeping? A crucifix let bless your neck. End your groan, and come away. CARI. Hence, villains, tyrants, murderers! Alas! What will you do with my lady?—Call for help! DUCH. To whom? To our next neighbours? They are mad-folks. Thine will be a poor reversion. CARI. I will die with her. BOS. Strangling; here are your executioners. Would do as much as they do. BOS. Doth not death fright you? This cord should terrify you. Best gift is they can give or I can take. I ’d not be tedious to you. FIRST EXECUT. We are ready. Bestow upon my women, will you? They then may feed in quiet. They strangle her. BOS. Where ’s the waiting-woman? Fetch her: some other strangle the children. Look you, there sleeps your mistress. Is ’t not so ordered? You are so well prepar’d for ’t. You kept her counsel; now you shall keep ours. FIRST EXECUT. Here ’s your wedding-ring. FIRST EXECUT. She bites and scratches. CARI. I am quick with child. You’d have her. But here begin your pity: Shows the Children strangled. BOS. Fix your eye here. BOS. Do you not weep? FERD. Cover her face; mine eyes dazzle: she died young. Seem’d to have years too many. Her time to a minute. If thou hadst borne her to some sanctuary! Between her innocence and my revenge! Go kill my dearest friend, and thou hast done ’t. What was the meanness of her match to me? That drew a stream of gall quite through my heart. And, for my sake, say, thou hast done much ill well. The reward due to my service. What I ’ll give thee. The largest bounty I can study to do thee. FERD. Mine! was I her judge? Deliver her conviction up i’ the court? Thou’st forfeited thy life, and thou shalt die for ’t. BOS. You, not I, shall quake for ’t. BOS. I will first receive my pension. FERD. You are a villain. Is judge, I am so. Never look upon me more. BOS. Why, fare thee well. Your brother and yourself are worthy men! I am angry with myself, now that I wake. That I may never see thee. To appear a true servant than an honest man. ’Tis a deed of darkness. Exit. BOS. He ’s much distracted. Off, my painted honour! We seem to sweat in ice and freeze in fire. What would I do, were this to do again? To store them with fresh colour.—Who ’s there? To take me up to mercy. The dead bodies you saw were but feign’d statues. BOS. O, she ’s gone again! there the cords of life broke. To do good when we have a mind to it! These penitent fountains while she was living? Unto a wretch hath slain his father. Worth my dejection. Exit [with the body]. Note 2. The Geneva Bible. Note 5. A warm drink containing milk, wine, etc. Note 7. A drug supposed to ooze from embalmed bodies. Note 10. An exclamation of impatience. To be invested in your revenues. To any safety I can shape myself. To know whither it is flying. DELIO. Sir, I have a suit to you. Of Antonio Bologna,—please you bestow them on me. Nor fit for me to give, nor you to take. Soon in private:—here ’s the cardinal’s mistress. Pleasure with it: ’tis yours. Which makes your grant the greater. Exit. PES. Do you know what it was? Only due to a strumpet, for it is injustice. I ’ll be a noble giver. DELIO. You instruct me well. ANT. ’Tis a noble old fellow. DELIO. What course do you mean to take, Antonio? As once his brother did our noble duchess. For better fall once than be ever falling. My life keeps rank with yours. ANT. You are still my lov’d and best friend. Exeunt. Note 1. Milan. A public place. Note 2. In escheat; here, in fee. PES. Now, doctor, may I visit your patient? PES. Pray thee, what ’s his disease? I need a dictionary to ’t. DOC. I ’ll tell you. PES. I am glad on ’t. They ’ll give me leave, I ’ll buffet his madness out of him. MAL. Why doth your lordship love this solitariness? FERD. Eagles commonly fly alone: they are crows, daws, and starlings that flock together. Look, what ’s that follows me? FERD. Stay it; let it not haunt me. MAL. Impossible, if you move, and the sun shine. MAL. O, my lord, you are angry with nothing. FERD. You are a fool: how is ’t possible I should catch my shadow, unless I fall upon ’t? When I go to hell, I mean to carry a bribe; for, look you, good gifts evermore make way for the worst persons. PES. Rise, good my lord. FERD. I am studying the art of patience. PES. ’Tis a noble virtue. FERD. Use me well, you were best. What I have done, I have done: I ’ll confess nothing. DOC. Now let me come to him.—Are you mad, my lord? are you out of your princely wits? FERD. Let me have his beard saw’d off, and his eye-brows fil’d more civil. DOC. I must do mad tricks with him, for that ’s the only way on ’t.—I have brought your grace a salamander’s skin to keep you from sun-burning. FERD. I have cruel sore eyes. DOC. The white of a cockatrix’s 3 egg is present remedy. FERD. Let it be a new-laid one, you were best. DOC. Now he begins to fear me: now let me alone with him. CARD. How now! put off your gown! DOC. Let me have some forty urinals filled with rosewater: he and I ’ll go pelt one another with them.—Now he begins to fear me.—Can you fetch a frisk, 4 sir?—Let him go, let him go, upon my peril: I find by his eye he stands in awe of me; I ’ll make him as tame as a dormouse. PES. Doctor, he did not fear you thoroughly. DOC. True; I was somewhat too forward. Hath fall’n upon this Ferdinand! CARD. [aside.] I must feign somewhat.—Thus they say it grew. BOS. Sir, I would speak with you. All health of mind and body. From Ferdinand.—Now, sir, how fares our sister? Take comfort from me. Why do you look so wildly? I ’d make you what you would be. Give it me in a breath, and let me fly to ’t. For musing much o’ th’ end cannot begin. Note 1. A gallery in the residence of the Cardinal and Ferdinand. Note 2. A dog which worries sheep. Note 3. A fabulous serpent that killed by its glance. Note 4. Cut a caper.